Faith is the means by which man encounters the living God through Jesus Christ in the Holy Spirit. Francis draws on key themes of his predecessor, Pope Benedict XVI, who wrote encyclicals on charity and hope. He intended to complete the set with a reflection on faith, which would also have underscored the Year of Faith that he launched. Benedict's history-making retirement meant he was unable to finish his encyclical. Francis took up the task, adding his own insights, themes, and emphases to the work begun by Benedict XVI. According to Pope Francis, Light of Faith is a "four hand document". Pope Benedict, Francis notes, "handed it to me, it is a strong document. He did the great amount of work". 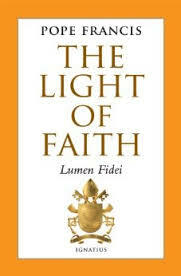 Thus, although officially Light of Faith (Lumen Fidei) is an encyclical of Pope Francis and reflects his teaching ministry, it is also reflects the work of Pope Emeritus Benedict. This is not only Francis' first encyclical; it is also the first encyclical to have been openly written by two successors of St. Peter.